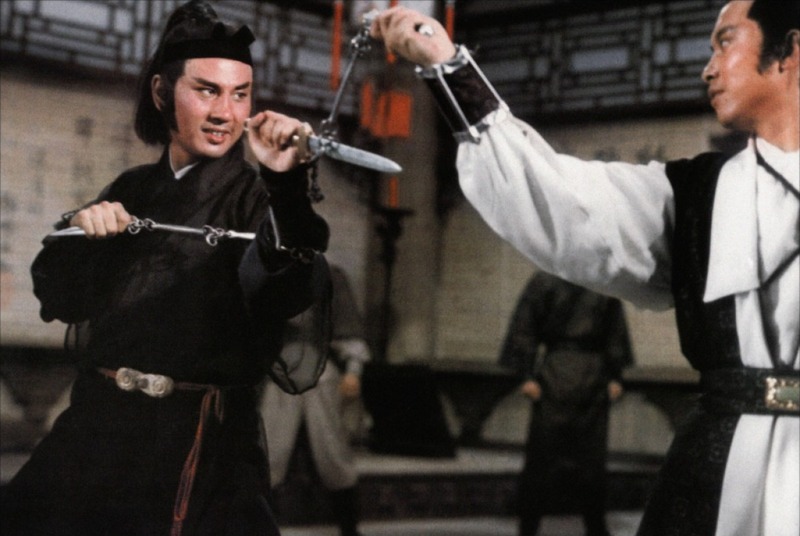 Showing more of a noir-by-way-of-Yojimbo influence than most Shaw Brothers films, this Chor Yuen-directed adaptation of a novel by Ku Lung shows that there’s more to kung fu movies than simple revenge and enlightenment plots. Chor takes his time setting up a world ruled by devilishly clever gangsters demanding absolute loyalty from their subjects. A master swordsman, Meng Sheng Wen, an assassin for hire, is ordered by his boss to kill the head of the Lung Men Society, Uncle Sun Yu. He takes his time heading out for the job (distracted as he is by a pretty, poetry-reciting girl living in the local Butterfly Forest) and in the meantime a gang war is started between the Lung Men Society and the Roc Society, a rival criminal organization. Various bodyguards are killed on both sides, and Uncle Sun’s secret weapon, Lo Lieh playing a mysterious man with a deadly, razor sharp hat, is killed, but by who? Was it Meng? A weaselly assistant-turned traitor? Or was it Uncle Sun’s right-hand man, the master of 72 secret weapons, Lu Hsiang Chuan (played by Yueh Hua, from Come Drink With Me)? The film is simply bursting with minor characters that Chor, along with the great stable of actors at his disposal at Shaws, is able to give more depth than their screen-time really earns. The most poignant, and disturbing, scene in the film comes near the end, as Uncle Sun makes his painstaking (and rather unbelievable) escape from an assassination attempt. A man who owes him his life helps him, and the price for that loyalty, as he well knows, is that he’ll have to kill himself to prevent Uncle Sun’s enemies from getting any information from him. Unfortunately, both the man’s wife and two children also see Uncle Sun. So the man and wife commit the group murder-suicide honor demands. It’s absolutely heart-breaking, and pushes the bounds of good taste, not unlike Hitchcock blowing up the kid on the bus in Sabotage. It’s telling though that in a film about disloyalty and betrayal, it’s those who are most loyal and honorable to their bosses who seem to suffer the most. Not only this simple peasant family, but everyone who aids Uncle Sun’s escape dies for the cause while only by betraying his master does Meng Sheng Wen defeat the “bad guys” and ride off with the pretty girl. Meng doesn’t have a “code” and he doesn’t do his job. He just does what he likes when he likes, like Mifune in the Yojimbo films. He has his own sense of right and wrong, and that is what dictates his actions, not some social construct like “honor” or “loyalty”. His greatest trait is that he’s flexible, where everyone else in the film is bound by their social status and proscribed role. Uncle Sun spends decades thinking up an elaborate escape route (to the point that he has a man living in the sewer below his house for years, waiting for the one day he’ll be able to help him escape on a boat) but never imagines that he could be betrayed by the person closest to him. Meng brings the Taoist corrective to the rigid Confucian world the gangs exploit. Meng is played by Chung Wa and while he brings a fine relaxed energy to the often overwrought Shaw Brothers world, but the role might have been better served with some Mifune-esque electric charisma. As it is, his character disappears for large sections of the movie, and at times he ends up seeming more passive and lucky than wise.